Latina/o Studies is a program at Williams College that offers a concentration and an opportunity for students to do an honors thesis. Concentrations at Williams enable students to do interdisciplinary work in a particular field. Latina/o Studies focuses on people who come from or whose ancestors come from Latin America and the Spanish-speaking Caribbean, including Mexican-Americans, Chicanas/os, Puerto Ricans, Cubans, Dominicans, Colombians, Guatemalans, and many others. In Latina/o Studies, the concentration consists of five courses: an introductory course, three electives, and a senior seminar. The Honors program in Latina/o Studies provides a wonderful opportunity for students to explore an area of interest to them in depth. Students work closely with their advisor and two readers to produce a substantial piece of scholarship or other form of presentation (e.g. video, art, theatre) in the interdisciplinary field of Latina/o Studies. The concentration also enriches many study abroad possibilities during junior year and Winter Study, and vice versa. Faculty members are work with students in deciding on study abroad and in building bridges between their classroom learning and their study abroad experiences. Latina/o Studies is a free-standing program, which is rare at liberal arts colleges. As a result, we are able to offer a range of courses and opportunities that students are unlikely to find at comparable institutions. Latina/o Studies is an interdisciplinary and comparative field of study that explores the histories and experiences of Latinas and Latinos in the United States. 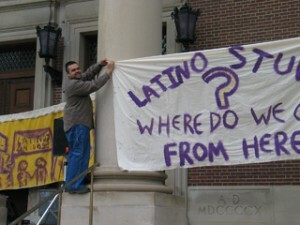 Latinas and Latinos include peoples who come from or whose ancestors come from Latin America and the Spanish-speaking Caribbean. The program seeks to cover the widest range of experiences, encompassing Mexican-Americans, Puerto Ricans, Cubans, and Dominicans, as well as more recent migrations from a wide variety of Central and South American countries. Courses, most of which use a comparative approach, seek to provide students with the tools to continue their work in areas of their particular interest. Focusing on a diverse group with a long history in the United States, which is also one of the fastest growing populations in the contemporary era, provides an opportunity to explore complex dynamics globally and within the context of the United States. The program examines topics such as the political and economic causes of migration, the impact of globalization, economic incorporation, racialization, the formation and reformulations of identities and communities, the uses of urban spaces, inter-ethnic relations, artistic expression, aesthetics, and visual and popular culture. The concentration in Latina/o Studies requires five courses. Students are required to take the introductory course (LATS 105), one 400-level Latina/o Studies seminar, and three electives. Two electives must be core electives, and one elective can be a related course in Comparative Race and Ethnic Studies or in Countries of Origin and Transnationalism. The three electives must include two different areas of study, and at least one elective must be at the 300 or 400 level. Additional courses may be approved by the Chair. Students, especially those considering graduate work or professional careers in the field, are encouraged to enroll in Spanish language courses at Williams. A full list of courses that satisfy the Latina/o Studies concentration requirements can be found here.